Can Tho (VNA) – Vietnamese Minister of Natural Resources and Environment Tran Hong Ha has stressed the need to strengthen cooperation with the private sector as well as leading businesses and corporations to make them key partners in helping APEC economies build capacity for production rehabilitation and resilience to climate change. Ha was addressing the Ministers and CEOs Dialogue on Responsible Use of Resources to Enhance Sustainable Food Production and Agri-Business in the Mekong Delta city of Can Tho on August 24 as part of the APEC Food Security Week. 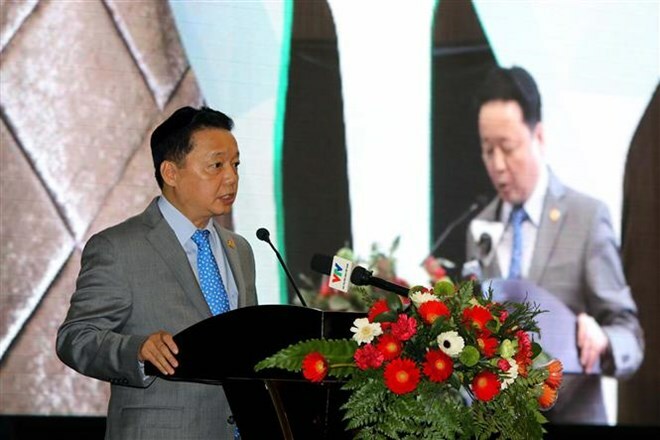 The participation of the business community has facilitated the Vietnamese Government to mobilise various social resources, including human resources with high qualifications and expertise, and diversified financial resources for infrastructure investment and services, he said. “Without the active engagement of the private sector, all Government efforts will be in vain,” he said. The public-private partnership (PPP) model has brought long term benefits, maximised performance of both public and private sectors while creating and spreading synergies and mobilise social resources, he stressed. The minister pointed out the fact that natural resources such as land, water, forest and sea are becoming more and more exhausted due to the rapid population growth and massive urbanisation. The rapid increase in terms of both frequency and intensity of weather extremes as well as other uncertainties have challenged the regional and global development, the minister said. To acknowledge the practical benefits of this model, over the past years, Vietnam has made great efforts to develop and consolidate an “enabling environment providing incentives for PPP development”. Vietnam will scale up the existing model to significantly contributing to the development of a sustainable, responsible and quality agricultural sector, the minister added.